The Nyjer Mesh Bird Feeder is the perfect finch feeder! Made by Aspects, a company with a long history in quality bird-related products, the Nyjer Mesh feeder is made to hold thistle and can attract a swarm of finches simultaneously and allows them to feed in any position, upside-down or rightside-up. Its breathable mesh design keeps the seed dry and fresh, and is built to attract goldfinches, siskins, redpolls, purple and house finches. A nickel-colored cap slides up and down easily when its time to refill or clean, and the feeder's fine mesh construction is protected from bending or denting by an integrated system of polycarbonate collars. Very happy with my feeder. The best yet. There are often as many as eight finches feeding at once. This is a wonderful, easy to maintain feeder. This is a great upgrade from the nylon bags which seem to need to be replaced 2-3 times a year. This is a very sturdy and quality item! This product is great! It is sturdy, easy to fill and clean and best of all the birds love it. I would recommend this product to any bird watcher. Attractive to look at and the finches love it too! The birds and I like it. It would be nice if it was a little longer. I am thrilled with this mesh bird feeder, the most practical and popular kind. I have several different bird feeders outside and I have at least a dozen or more finches dining at it all the time. They love this particular feeder. Your website delivered it very fast and I'm thinking on ordering more for gifts. Thank You! I love this bird feeder! Sometimes there are a dozen small goldfinches chirping and clinging to the sides feeding. My other finch feeder has perches so the doves use it too, scaring away the smaller birds. The doves aren't able to use this feeder. The feeder is well designed and its construction is of high quality. The wire mesh as well as the top appear to be stainless steel and should last forever. The feeder can be hung from above using the supplied heavy wire loop. It can also be pole mounted using a hole in the base of the feeder containing a standard 3/4" pipe thread. All birds are messy eaters and the feeder would benefit from attaching the (optional) tray onto the base of the feeder. I used a 16" metal pie pan, cut a 3/4" hole in the center and used threaded pvc sprinkler pipe fittings to fasten the pan to the hole at the bottom of the feeder. You could also use a plastic serving tray or base of a large plastic flower pot. Filling the feeder is easy using a garden watering can containing the tiny Nyjer seeds. I really appreciate the quality of this product and plan to have it for many years to come. We have all kinds of goldfinches since putting these feeders up. I have about 10 Golden Finches on the feeder at once. They love the thistle seed in it! It is durable and easy to fill. Thanks for supplying a great product! I will use your website again. The finches love it! However, there is a loss of seed through the mesh that causes a problem. Our feeder is hung from a tree over our lawn. We now have a lump (mound, knob) of thistle in our grass under the feeder. We've tried putting a large piece of cardboard under the feeder, but that's not a real solution. Well, we love seeing the busy little birds and can(so far) afford the frequent fill ups. This feeder certainly works better than the "socks" we have used previously. We enjoy and identifying the various species that frequent our yard on a canyon. We don't get the cold weather birds of other areas but do see our own assortment of colors, scrub jays, western orioles, house finches, humming birds and an occasional hawk (the latter not at our feeders, but in our trees or yard). This feeder is attractive, durable, and easy to keep clean. The goldfinches and nuthatches use it daily, but they seem to prefer the alternative feeder that has a clear plastic cylinder with wooden perches. The mesh tube finch feeder is solidly made and attracts an occasional golden finch and house finch, but mainly nuthatches. Perhaps, in a few months it will attract more finches. 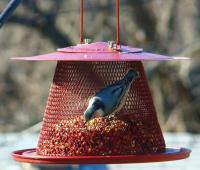 This feeder is very well made and will see many seasons of feeding. Thank you for your exceptional customer service as well!